I have been excitedly waiting for Great British Bake Off all week and last night's comeback did not disappoint! I'm already hooked and struggling to choose a favourite. I like the girls this year, some of the boys seem a little dull, but I'll give them a fair chance to impress! I won't say what happened in case you haven't watched it yet. Today's design is Bake Off inspired strawberry tarts, well, it's meant to be. This was definitely one of those designs that looks a lot better in your head than on your nails. There is just something missing. I bet you didn't even know it was supposed to be strawberry tarts until I just told you! It just wasn't happening for me #nailfail. I feel like I've let Paul and Mary down, maybe I should stick to actual baking? I used five polishes for this design and my trusty Barry M nail pens. I say trusty but I think they're at the end of their lives which was not helping me get crisp lines, a contributing factor to the overall messy look which was not what I was going for! The polishes are Barry M - Caramel*, Cardamom* and Key Lime, Nicole by O.P.I - Yoga-Then-Yogurt* and Rimmel - Double Decker Red*. This is the same red I used for my last strawberry design, it's just the perfect shade! 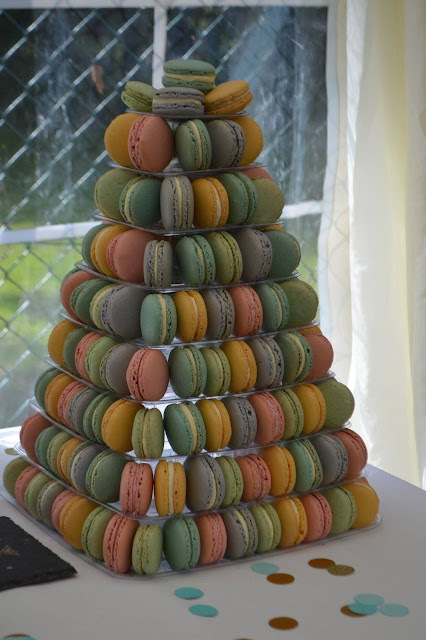 To prove my actual baking is better than my nail-baking, here's a macaron pyramid I baked for a friend's wedding recently! Today's verdict - must try harder. I'm not sure I'd have got through to the second week with this effort but luckily for me I'm not in Bake Off so don't have to worry. Hopefully you guys will welcome me back with my next effort? This is such a cute idea, I love that Bake Off is your inspiration!